Hi guys! Let me just start things off by saying I'm new here, so if this thread is in the wrong section or anything like that, I apologize in advance. I simply cannot figure out what's going on with my MK5, and I decided to turn to forums to (hopefully) get a better understanding here. For those of you with coilovers - I recently installed a set of JOM Blue Line Coilovers from ModdedEuros. They're not the most expensive or well-known brand, but I had heard good things and they seemed like a good fit for my budget. Installation went smoothly (entirely new hardware, replaced a CV Joint and a sway bar end link, new mounting pads - basically new everything), and I'm fairly satisfied with the ride height of... almost all of the wheels. The only problem is that the front passenger side coilover literally will not lower, and I don't know how else to describe it. I can take pics if needed, but my car quite literally does not sit lower after adjusting it. I have about a half inch of threads on the adjustment threading that is basically useless. If I lower the adjustment nut all the way down (I've heard from others that this is enough to completely slam the car), the car will not lower. Don't get me wrong, it definitely sits lower than factory suspension - but it's almost like there is something else locking it in place. Could it be the sway bar end links? Adjustables are available for sale from numerous companies. The top 3/4 of the threading works flawlessly, but I cannot get the car to sit any lower. Measuring from the inner bead of the tire (hard to explain) to the center of the fender in the wheel well, I cannot get the suspension to drop to less than a 4 inch gap. I also have this problem with the drivers side, but that side will sit slightly lower at about 3.8 inches. Some solutions that I thought it could have been were the adjustable sway bar end links, and some kind of ride height sensor on that side. 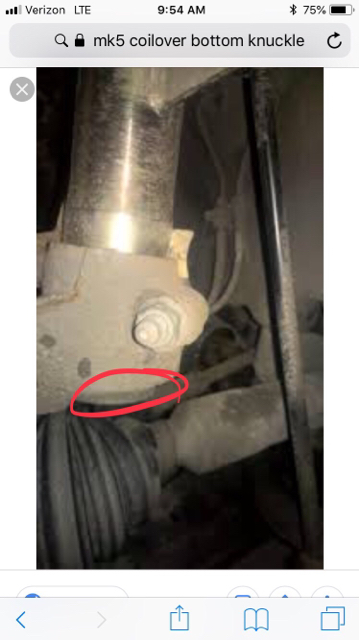 The passenger side also happens to be the same side I replaced an OEM Sway Bar end link, so it's possible I installed the wrong one or it is upside down. Really any insight on this situation is useful. The simplest way to put it is that when I lower the adjustment nut on the ride height threading, the car does not lower past a certain point. I can run that nut all the way to the end, or leave it a half inch up the threads with no ride height difference. How low are you right now? there's about 1.5in in wheel gap on the front passenger, 1.25 on the front driver. In a perfect world, I'd like about a .5 inch wheel gap all around. I'm nowhere near low enough on that side to be needing a notch... or so I thought? could that be a possibility? here's a pic of the passenger side - https://imgur.com/a/G8vfJXX? What’s your fender to ground measurement? Im at 24” with OEM end links with no issues. Make sure the strut is bottomed out in the knuckle. There’s a lip it sits on. Yeah you're not low enough to need a notch. See other thread & post above....you need to spread the spindle with a strut spreader and make sure the the strut is fully seated in the spindle. The OEM end links shouldn't be an issue either.